Purpose of Profit: what is the role of business? “The social responsibility of business is to increase profits” was the title of Milton Friedman’s New York Times article . As a Nobel Prize winner he was also one of the most influential thinkers in economics in the 1970s. 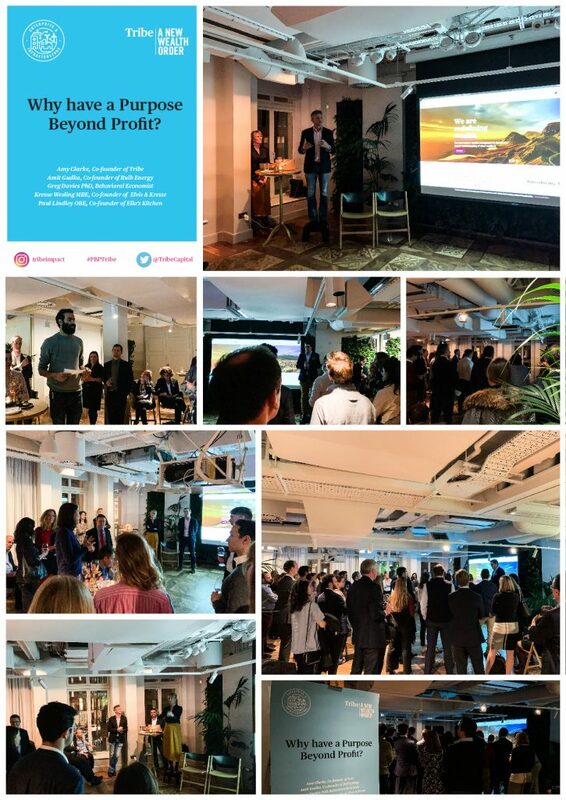 At Tribe’s Purposeful Business event we heard that since that article was written, humanity has wiped out 60% of mammals, birds, fish and reptiles . And today air pollution alone is responsible for around 7 million premature deaths every year . Something isn’t working. But what responsibility does business have: should a business have a purpose beyond profit? To answer the question, Tribe brought together four inspiring story-tellers into our home at The Conduit Club in London. Firstly we asked three entrepreneurs running purposeful businesses about their experiences, how purpose affected their decision-making, and other lessons they’d learned. In 2018 the fastest growing private business in the UK was the renewable energy retailer Bulb Energy . The cofounder, Amit Gudka, told us how their culture was key to their growth story. Amit has tried to create a culture that’s honest and fair – and at times is counter-intuitive to the short-term profit maximising of their competitors. For example, when the UK government raised their price-cap in February, most of the industry saw this as a justification for raising their own prices. Bulb haven’t. In fact, one of the reasons behind setting up Bulb was what Amit and his co-founder Hayden saw as an unjustifiable premium that incumbent energy providers were charging for green energy. Amit explained that, whilst they didn’t set out to create a revolution, they did want to disrupt a sector known for poor customer service and short-termism. By hitting their one millionth customer at the beginning of 2019 they’re creating the right kind of waves. We also heard from another disruptive entrepreneur, Kresse Wessling, co-founder of sustainable designer brand Elvis & Kresse. Despite the emphasis that luxury brands put on the provenance of their raw materials and products, Kresse explained how wasteful the industry still is. They set up the business after asking what happened to London Fire Brigade’s hoses once their useful lives. Instead of going to landfill, thanks to Kresse and her team they’re now re-purposed in the brand’s Kent workshop – itself an upcycled building. Part of Elvis & Kresse’s purpose is in sharing this story and inviting everyone to see their manufacturing and premises. This transparency even extends to their financial accounts which they share, along with their profits – half of which go to charities. Kresse also told us about their next phase of growth. Whilst the amount of discarded fire-hose could fill a room the size of our event’s, one fashion brand throws away enough leather to cover a Caribbean island. This tragic waste is part of the inspiration behind the next chapters for Elvis & Kresse’s: watch this space. Our third entrepreneur was the founder of Ella’s Kitchen, Paul Lindley. Having set the business up in 2006, Ella’s Kitchen recently sold their billionth item of baby food. Paul left the business last year, which has allowed him time to reflect on the journey. Central to his success have been people, their attitude and shared culture. Paul has captured much of this thinking in his book, Little Wins: The Huge Power of Thinking like a Toddler , where he promotes the importance of being creative and adventurous. As he shared anecdotes from his research, we were reminded that we can be playful and joyful in business. Along the Ella’s Kitchen journey, Paul found that having a central purpose is a critical focus for people and his emphasis was on people making the company, not the other way around. Having heard about why purposeful businesses make sense, our fourth speaker explored the role and responsibilities of investors. Greg Davies is Head of Behavioural Science at Oxford Risk and a Fellow at Tribe. He gave the audience an overview of research he’s been involved with in both the US and UK, explaining that American attitudes are generally more open to investing with purpose and impact than their British peers. The research also revealed that awareness is one of the single biggest inhibitors to growth of impact investing  and Greg explained the onus on financial and investment advisors to help educate and guide investors. The work also found six segments of UK investors with distinctive attitudes to impact investing. The smallest two groups, together known as the “Sceptics”, weren’t interesting in aligning purpose and investments. They make up only 27% of the population. Two groups of interested investors, “Impact Maximisers” and “Value Aligners”, represent 32% of UK investors. These are the investors whose thinking is aligned with our entrepreneurs. And, as Tribe’s earlier work with Greg has shown in Investing for Real People , these attitudes can make for better investment outcomes. As the evening drew to a close we reflected on the stories we’d heard from our inspiring speakers. What become clear was common theme of purpose and people. These were the twin threads woven into the successes of our inspiring entrepreneurs; they’re also the threads that investors are already looking to support. We left excited by the possibilities generated by this much-needed new thinking, with an enormous debt of gratitude to our story-tellers, friends and guests. Tribe is the UK’s first impact wealth manager. In providing advisory and discretionary investment management, we help our clients to align their wealth with their financial requirements, their personal values, and the impact they want to create. To find out more, please visit www.tribeimpactcapital.com. Tribe Impact Capital LLP is authorised and regulated by the Financial Conduct Authority (“FCA”). Our FCA registration details are set out in the FCA Register under Firm Reference number 756411 (www.fca.org.uk). Tribe Impact Capital LLP is registered in England and Wales (registered number OC411984) and our registered office is 14 Cornhill, London EC3V 3NR. This document is for information and illustrative purposes only and is for use of the recipient. It is not to be reproduced, copied or made available to others. This document is considered to be a general market or informational commentary and does not constitute any type of investment or other professional advice, it is not a personal recommendation and does not take into account the particular investment objectives, financial situations or needs (including tax) of individual clients. This document is not intended and should not be construed as an offer, solicitation or recommendation to buy or sell any specific investments or participate in any investment (or other) strategy. You are recommended to seek advice concerning suitability of any investment from your investment or other professional adviser. Investors should be aware that past performance is not an indication of future performance and the value of investments and the income derived from them may fluctuate and you may not receive back the amount you originally invested. Not all investments mentioned are regulated by the FCA. The information and opinions expressed herein are the views of Tribe Impact Capital LLP and are based on current public information we believe to be reliable but we do not represent that they are accurate or complete and should not be relied upon as such. Any information herein is given in good faith, but is subject to change without notice. No liability is accepted whatsoever by Tribe Impact Capital LLP, employees and associated companies for any direct or consequential loss arising from this document. This document is not for distribution outside the European Economic area.